Welcome to #125 Breakers! We believe that you will be very pleased wiith booking a Great Vacation... in a Great Place... and at a Bargain Price!!! This villa has an open design to the living room, kitchen and eating area. It has been beautifully renovated (floors, ceilings, windows, doors and walls) and redecorated (comfortable furniture, wood floors, ceramic tile (Bath), Kitchen Cabinets, Granite Counter Tops, electronics, appliances, Washer, Dryer, Glass Enclosed Bathroom Shower and wall hangings. It even has a make-up vanity. It has a contemporary ocean cottage feel. Sleeping accommodations include a Master Bedroom with a queen-sized bed and a queen-sized sleeper sofa in the living area. Our Villa is located on an elevated first floor and provides Beautiful and Unobstructed Straight On Views overlooking the heated pool and onto the beach and ocean. It is located in the center of the Breakers 'Horse Shoe' so you can share in all the excitement that this complex has to offer! You are literally a two (2) minute walk to the beach! The Breakers complex is comprised of 120 separate units in a three story-building complex. Located on the elevated first floor, there is no hassle of walking up flights of stairs. This Villa is perfectly situated to take advantage of true oceanfront living! The impeccably maintained oceanfront pool PLUS a Kiddies pool is just a few steps away. 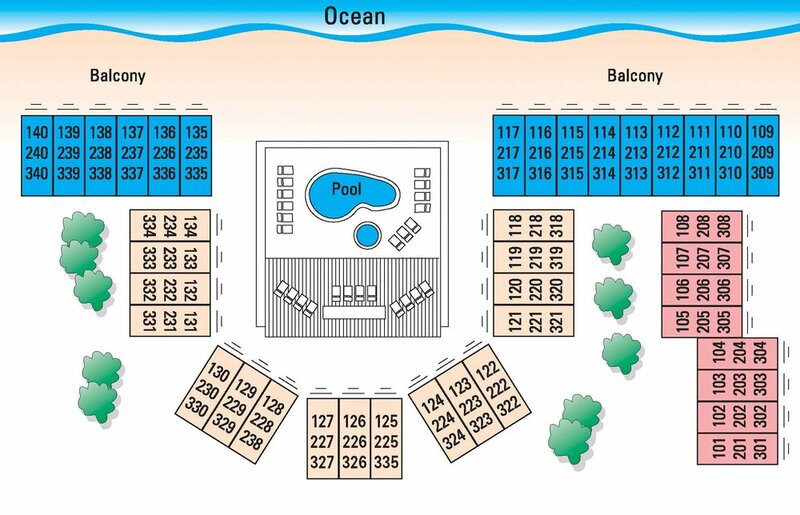 All surrounded by a large sun deck area with lounge chairs provided. Breakers is located in the popular Forest Beach area. Coligny Plaza, famous for it's over 60 shops and restaurants is located immediately across the street. An abundant amount of top quality island golf courses are minutes away. Couldn't have chosen a better location. BALCONY LOCATED JUST OFF OF LIVING AREA. A DIFFERENT LIVING AREA VIEW. SEATING WITH RECLINER, SWIVEL CHAIRS AND DINING TABLE. ENTRY VIEW INTO KITCHEN AND LIVING AREA.